There's always a love/hate type of relationship with documentaries. I can't recall ever seeing a "bad" documentary in the sense that it was poorly made. 90% of the time, if one doesn't like a documentary, it's because of the subject matter. Would I want to see a documentary about how certain jungle spiders survive? Um, no, but my lack of interest doesn't mean it's a bad film. First time filmmaker, Sonali Gulati's documentary, I AM, explores the Lesbian/Gay/Bisexual/Transgendered (LGBT) culture in India. Gulati herself is a lesbian and never came out to her mother. By the time she became comfortable enough in her own skin to come out, her mother had passed away. Gulati's feature is episodic in nature as she travels across the country interviewing LGBT men and women, and how they dealt with coming out to their families. What was utterly fascinating was seeing the culture of India where being openly gay is a criminal and punishable offense. Though some areas are more rigorous with their laws, Gulati's interviews shed so much light on the inner strength these individuals face. The interviews range from the lower class to the elite, and families that complete understand to those who take drastic actions. We don't spend a great deal a time with all the interviewees, but Gulati is able to draw such realism and truth from them that we feel for their story, even if it's only five minutes long. If anything, Gulati could have cut down the number of people we see and spend more time with the more poignant stories. At the heart, Gulati's movie is a story of optimism. 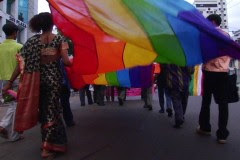 Even though many, not all, but many of the LGBT community in India cannot live freely the way they want, there's never an ounce of hatred emitting from them. They just want equality and to live life the way they want. One aspect that is featured prominently is how tradition and religion is rooted within the Indian culture. The older generation is so focused keeping their family name respectable, it's hard to imagine anyone accepting this lifestyle. However, there are some wonderful moments with some family members who whole-heartedly accepted their sons and daughters for the way they are. Unfortunately, there aren't as many of these stories as there should be. I AM is currently making the festival circuit rounds and is a clean, focused 75 minute film. And for a first time filmmaker, Sonali Gulati has captured a culture that many of us don't get to see, and she has a bright future ahead of herself. Sonali Gulati is not a first time filmmaker. She has been making films for over a decade. Just google her and you'll get the facts. She's made lots of films that have screened at over 200 film festivals worldwide.